A hi-hat stand with advanced features that earns the name Speed Cobra. 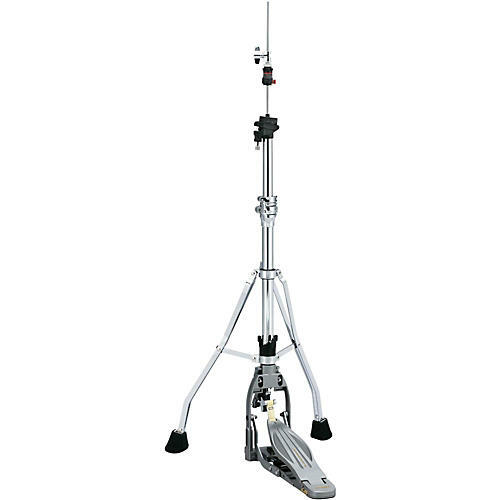 The HH915D features the same long footboard as our Speed Cobra Bass Drum Pedal. Its core design is based on the Iron Cobra Hi-Hat Stand, widely recognized as one of the best performing hi-hat stands in the world. The longer footboard offers footwork flexibility, added control and sensitivity. The latest innovation on this stand, the new “Quick-Set Clutch”, allows hi-hat cymbals to be quickly attached and removed. The Hinge Guard Block on the footboard holds the bearing more evenly, minimizing stress and maximizing smoothness. The idea of replacing the traditional pull mechanism with a lever design was a genuinely revolutionary concept. The Iron Cobra version uses roller bearings at the lever fulcrum for even smoother footboard action while a super-strong Kevlar® strap connects the footboard and pull rod for even, noise-free action. The construction of the Bearing Hinge on the footplate has changed from a one-piece assembly to two pieces. This design holds the bearing more evenly – minimizing stress and maximizing smoothness, while also adding to the pedal's sense of power. Speed Cobra hi-hat stands now come with both long and short cymbal rods, allowing drummers a choice based on their unique setup needs.